On August 7, 2011, the number of Chinese people who quit the Chinese Communist Party (CCP) and its affiliated organisations through The Epoch Times website exceeded 100 million. This marked a historical day and a milestone that signifies that the Chinese people have awakened from the mind shackles of the CCP. It is also a symbol that the CCP is heading toward its end. The Service Centre for Quitting the CCP in New York celebrates 100 million people quitting the CCP. At 4:00 p.m on August 7, the Global Service Center for Quitting the CCP, headquartered in Flushing, New York, held a celebration. 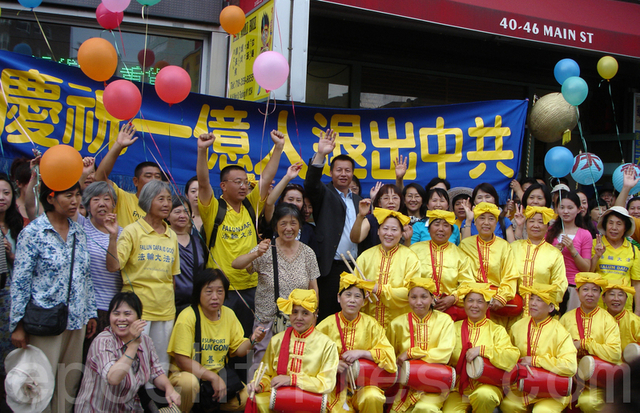 Over 100 volunteers from the Service Centre held lanterns, balloons and banners written with “Celebrating 100 million people quitting the CCP.” Waist drummers with yellow clothing were dancing and singing. Many passersby were attracted to their celebration. One person was amazed and took a picture of the historical scene. On November 19, 2004 The Epoch Times, an independent news outlet outside of China, published Nine Commentaries on the Communist Party, a book which analysed the CCP’s violent, deceptive nature and its antagonistic stance toward nature and humanity. The book quickly spread to every corner of China and all over the world and triggered the movement of Chinese people quitting the CCP and its affiliated organizations. On July 14, 2011, the US Senate introduced bipartisan Resolution 232, which recognizes the Quit-the-CCP movement, whereby Chinese citizens renounce their ties to the Chinese Communist Party and its affiliated organizations, and calls for an immediate end to the persecution of Falun Gong practitioners. Mr. Wang also warned the officials who actively participate in the persecution, asking them to stop immediately and confess their crimes. The volunteers at the Service Centre for Quitting the CCP in Los Angeles held a celebration on August 7 as well. The spokesperson Ms. Li Hailun said at a rally that in the past, many have wondered and worried whether the trend of quitting the CCP and its affiliated organizations could become large and maintain its growth. Ms. Li also said that the CCP has been threatening, intimidating and enticing and even physically attacking the volunteers at the service centres. It even tried to hack into the website that helps people to withdraw from the Party. However, the CCP underestimates the power of the Nine Commentaries and human nature. “Six years have passed and the stream of quitting the CCP has become a powerful current that is comprised of over 100 million people. It is crystal clear that history and the people have chosen to eliminate the CCP,” said Ms. Li. Zhang, a Falun Gong practitioner from China who just arrived in LA said that nowadays people in China live a difficult life whether they have money or not: “The CCP has destroyed the traditional Chinese culture and people’s morality. It has brainwashed its people to be greedy, and to fight and struggle against each other.” Zhang believes that the 100 million people who have quit the CCP organisations have clearly recognized the CCP’s evil nature.